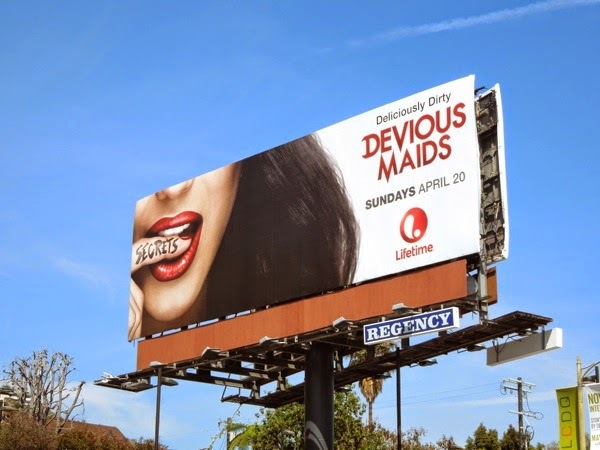 Put down those mops and buckets, brushes and dusters, it's time to dish some deliciously dirty secrets now that those Devious Maids have returned for a second seductive season. 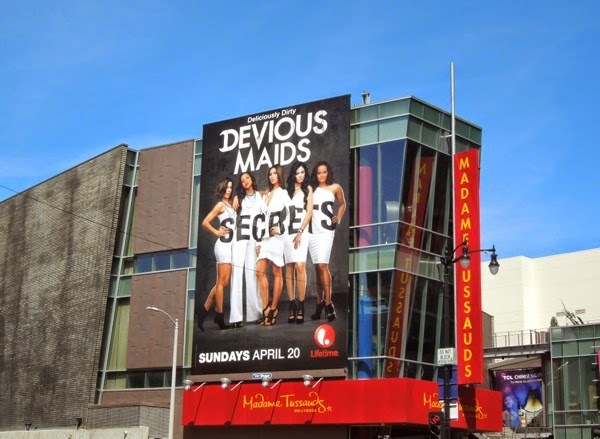 The all-Latina cast of Ana Ortiz, Dania Ramirez, Roselyn Sanchez, Edy Ganem and Judy Reyes are probably some the most beautiful housekeeping staff Daily Billboard has ever seen, but that hasn't stopped Marc Cherry's dramedy from being a big hit for Lifetime. 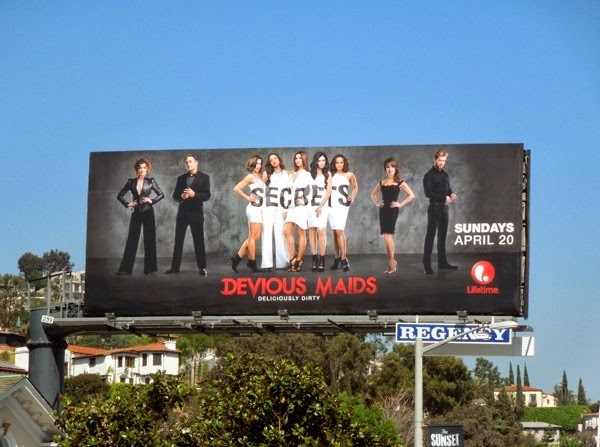 Despite initial criticism for stereotyping Latinas before it had even aired, the show's ratings continued to climb in their first year and now they're back for a hopefully successful sophomore season. 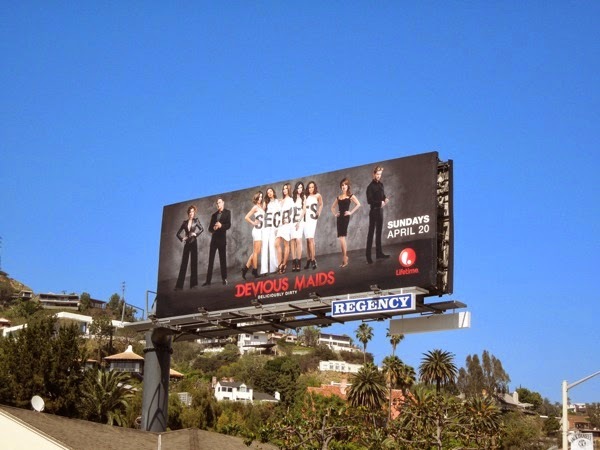 To kick start the new season Executive Producer Eva Longoria of Desperate Housewives fame will make her directorial debut on the opening episode. 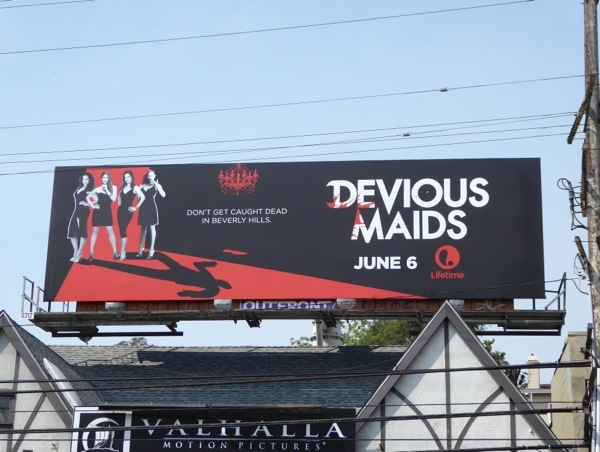 It looks like life for this close-knit group of Beverly Hills maids is about to become even more complicated in the aftermath of murder, with new romances, immigration problems and new employers resulting in more mayhem, secrets and lies. 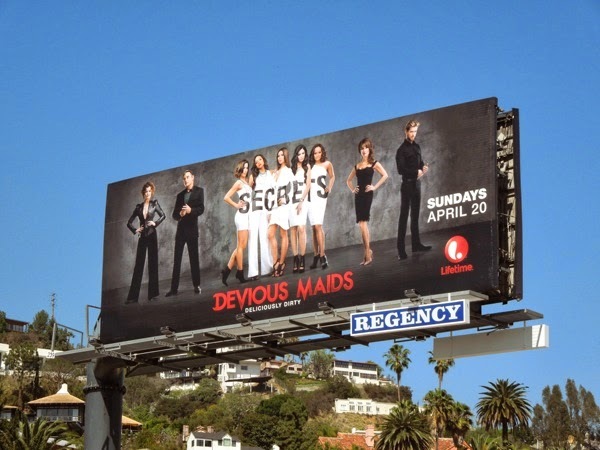 The season two billboard showing the maids in angelic white and their employers in devilish black was first spied along L.A.'s Sunset Plaza on March 19, 2014. 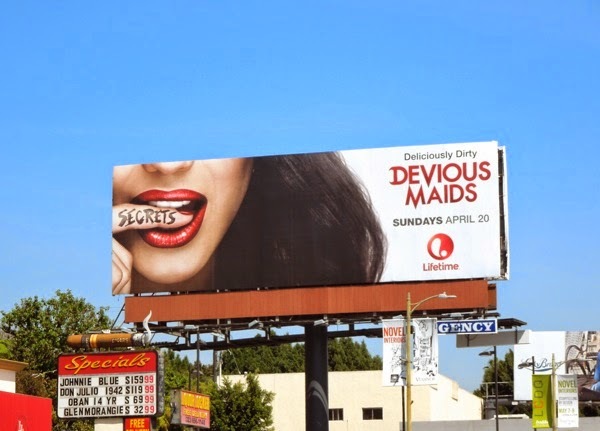 The flirtatious 'finger in mouth' teaser creative was spotted further east along Sunset Boulevard, whilst the larger portrait 'secrets' version was snapped along Hollywood Boulevard on April 3, 2014. 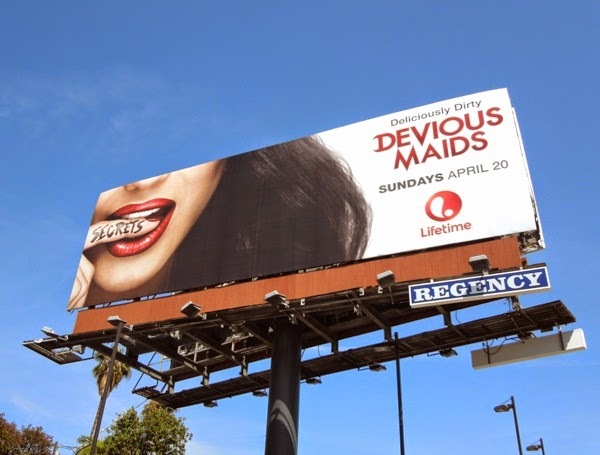 If you're already a fan of the Lifetime show, be sure to check out these fantastic season one billboards for Devious Maids (and there were a lot of them). 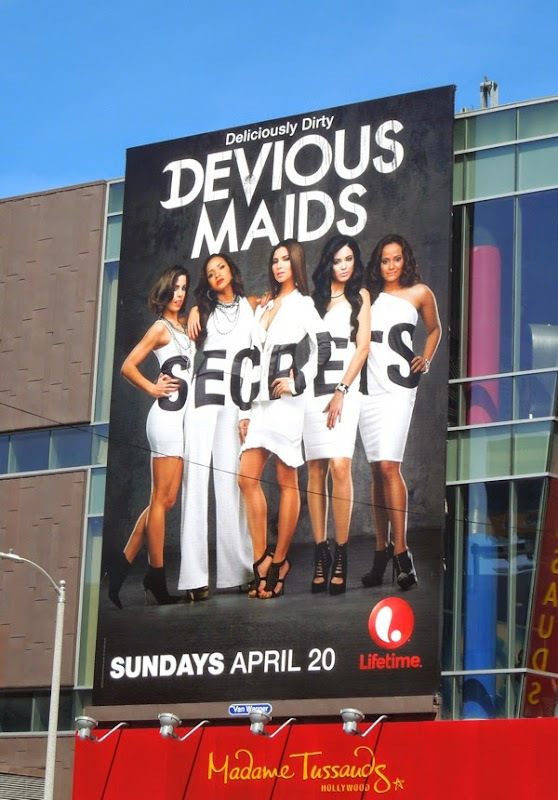 Now stop your gossiping, put your apron on and get back to work, those mansions won't clean themselves you know. 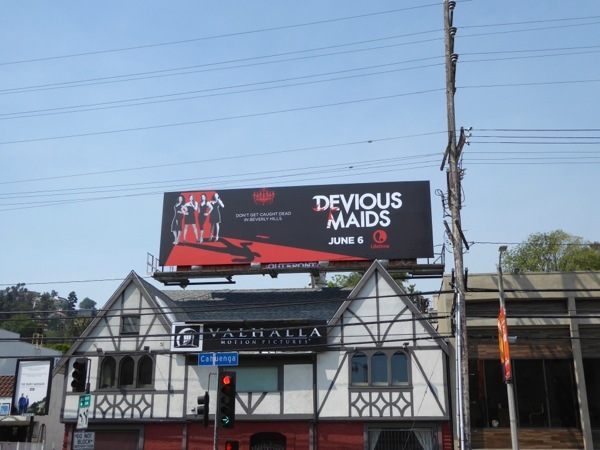 UPDATED: Here's also the cool billboard for the fourth season of Devious Maids, snapped at the bottom of Barham Boulevard at Cahuenga Boulevard on June 17, 2016.